Anne Francey lives and works in Saratoga Springs, NY. Born and raised in Switzerland, she graduated from the Ecole des Beaux-Arts (ECBA) of Lausanne, before moving to NY where she received an MFA from Hunter College. 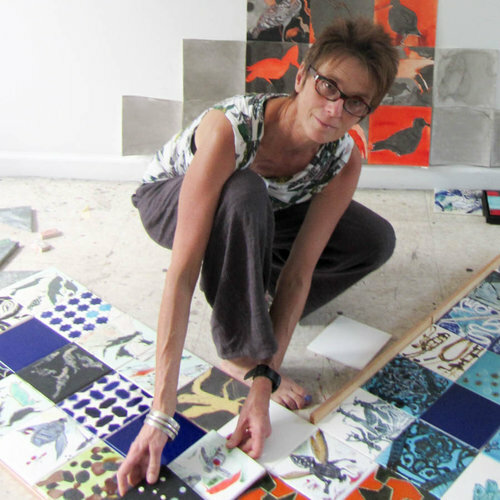 Initially immersed mostly in the painting and drawing media, she has incorporated ceramic into her practice after living in Tunisia, where she was inspired by the traditional tiles design and technique typical of Moorish architecture. She has taught studio art at Skidmore College and other colleges in the Capital region for over twenty years, and also teaches ceramic painting workshops. She has been involved in the creation of numerous community murals that included hundreds of participants, especially in schools. The Tile like ceramic pieces are to be hung on a wall like paintings. The relationship between geometric patterns and various configurations reflects on our need to find meaning in the events that shape our lives. But while geometric designs inevitably incorporate the unpredictable nature of the hand and fire that modeled it, more organic shapes strive to find a semblance of order. The Scroll series are a reflection on time passing and time to come: one day, our present will inevitably become the past. Is it also possible that what inspired these images and has now been permanently hardened onto the clay’s surface will be part of the past? Will nature or some manifestation of nature as we know it, exist only as fossils imprinted in a rock?